Our hair is our crowning glory. It is, in many ways, an outward sign of health or age. Lets’ face it. As we grow older we tend to lose more hair, and this happens for many other reasons aside from genes. Inexplicable hair loss is a great source of stress, more than stress being a great source of hair loss. Women are terribly bothered by daily hair fall when they comb their hair. But so long as you don’t see a dark clump of hair leftover, this is thought normal. Hair loss happens when it is followed by itching. Contrary to popular belief, even children experience hair fall. Hair loss is a result of many factors. People who have undergone a major operation are prone to have hair loss. This is a result of stress from your sickness as well as from your period of recovery. 1. Hormonal imbalance. Teenagers who have hormonal imbalance may have falling hair. It is because at this stage, teenagers’ thyroid glands are either working at its peak or at an all time low. Women who have given birth experience falling hair that lasts into the 3rd month. Then again, it is a result of hormonal imbalance. When a woman is pregnant she releases special hormones that protect her from having hair loss. But when she gives birth, her hormone levels return to normal which results in hair loss. This cycle of hair loss and hair gain goes on for a while. 2. Medicine. There are potent medicines that can cause slight hair loss to massive hair loss. Some of these medicines are purportedly a cure for hypertension (called anticoagulants), cure for gouts, and those used for cancer chemotherapy. Too much vitamin A and birth control pills may result in hair loss too. 3. Infections. 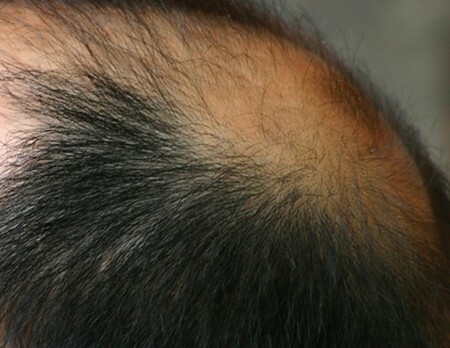 Some infections cause hair loss such as fungal and skin infection on the scalp. 4. Stress. It could be work-related or personal, brought on by family or social forces. Stress is basically a response to a stimuli so your body reacts to it in a variety of ways: if your body reacts negatively to that stimuli, your balance is broken. One of its manifestations is hair loss. This usually happens when you have no outlet or avenue for expressing your feelings. In many cases, once the balance is back to normal, you regain your hair. 5. Diet. Dieting can backfire. While it is ideal that we live with a balanced diet, an ill-advised daily fare lacking in essential vitamins and minerals will lead to hair loss. Whatever diet you subscribe to (South Beach, Mediterranean, Okinawan, among others), make sure you get enough Vitamin A, folic acid, vitamin B12, B6, and protein, if only for your hair. 6. Genes. There’s no running away from this one. It’s deeply imbedded in your DNA, so the most you can do is cushion the hair loss. You can never grow your hair back. But you can prepare yourself well for the head-on clash with your future hair style– look at your family album about two generations back. If a receding hairline doesn’t come up in one generation, it surely will in the next. Of course there are hair replacement therapies available today–that is, if you’re willing to pay the price. 1. Avoid having pigtails, dreadlocks, and cornrows. They create a knot that pulls at the roots of your hair. 2. Avoid using harmful hair treatment formula. Hot oil, hair spray, or perms cause hair damage by making your hair follicle swell. This results in scarred hair strands and roots. 3. Eat the right kind of food, particularly those rich in protein. Protein and iron make your hair strong, so the few ones left will not easily give way to stress of combing and hair- styling. Hair is associated with your level of self confidence: The more hair you have, the higher your confidence. Why Does my Scalp Hurt? Why Does Easter Fall on Different Days Each Year?